For the baseball player, see Dylan Carlson (baseball). 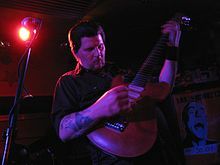 Dylan Carlson (born March 12, 1968) is the lead guitarist, lead singer, and only constant member of the drone doom group Earth, and the main contributor to his solo project Drcarlsonalbion. Carlson was born in Seattle, Washington, United States. His father worked for the Department of Defense, and, as a result, as a child he moved quite frequently, living in Philadelphia, Texas, New Mexico, and New Jersey, before coming back to live in Washington state. He had first become interested in being a rock musician at age 15, inspired by bands such as Molly Hatchet, AC/DC, and Black Sabbath. He also cites the Melvins, and composers La Monte Young and Terry Riley as major influences on his music. It was in Olympia, Washington that he met Slim Moon, Greg Babior, Dave Harwell and Joe Preston, with whom he would later form Earth. During this time, he would often make "sonic collages" with his then-roommate Kurt Cobain. From 1991 to 1996, Earth had an ever-changing lineup. Carlson attributes a lack of (full-length) studio album recordings from 1997 to 2005 to "legal and drug problems". ^ a b c robwrong (October 14, 2002). "An Interview with Dylan Carlson of Earth..." CosmicDoom.com. Archived from the original on 2009-01-13. ^ Edwin Pouncey (November 2005). "Earth". The Wire. Archived from the original on 2007-09-27. ^ Doctor Rock (March 24, 2006). "Dr. Rock vs. Earth". Playlouder. Archived from the original on December 5, 2006.